When retail businesses shut their doors, consumers can be hurt. They may lose deposits on ordered merchandise or services. Gift cards may become worthless. Warranties and repair plans may become void. “Going out of business” sales may not always provide the deals they promise. Understand the risks and your rights before you buy. If you paid for merchandise or services you haven’t received, talk to the store’s owner about receiving a refund or your order. Many businesses will try to make good on the deal. Unfortunately, we’ve also received complaints from consumers who never received their custom-designed furniture, as well as couples who were denied refunds when the venue they reserved for their wedding declared bankruptcy before they exchanged their vows. Tip: Prevent problems by paying small deposits. When you order merchandise that will be delivered in the future, such as furniture or a bridal gown, a store usually asks for a deposit. Always ask the retailer the minimum deposit it will accept. Pay with a credit card because laws provide you with safeguards if the business fails to deliver the merchandise. Always ask for a receipt for your deposit. If you paid for your merchandise by credit card, you can request a refund of your deposit from the credit card issuer. The procedures to request a "chargeback" are explained on the back of your credit card statement. If the business has filed for bankruptcy, you can file a claim with the U.S. Bankruptcy Court where the business filed to try to recover what you’re owed. Bankruptcy law spells out who gets paid first from any available assets. Administrative costs for the bankruptcy case are first in line. Next are "secured creditors" whose claims are secured by the business' property or other assets. Farther down in priority are "unsecured creditors;” as a consumer creditor who has paid for goods never received, you're ordinarily in that category. You may receive all, some or none of your deposit. Consumers should weigh the potential benefits of a successful or partially successful claim against the inconvenience and expense of pursuing the claim. A local store probably would file for bankruptcy in the U. S. Bankruptcy Court for your region. A chain or national store might file in the region where it is headquartered or incorporated. A list of courts nationwide and links to their websites can be found here. You usually have only 90 days from the bankruptcy filing date to file a claim. Contact the clerk of the bankruptcy court to obtain a standard "proof of claim" form. You can also download a proof of claim form by visiting the website for the bankruptcy court where the bankruptcy was filed. For bankrupticies filed in the Western District of Washington, you can access information for filing a proof of claim form here; for the Eastern District of Washington, click here. You’ll need to know the identifying name and number of the bankruptcy case and provide copies of receipts and records. If the store has not filed for bankruptcy, you can take the business to court. Collecting a judgment can be very difficult, time-consuming and expensive. Small claims court may be an option for disputes involving $5,000 or less. Click here for more information about filing in small claims court. If a store closes with something of yours inside, such as an appliance brought in for repair or a pre-paid special order, try contacting the owner. If that doesn't work, you may want to contact your local police department or sheriff’s office and small claims court. Gift cards are convenient and extremely popular. Washington’s gift card law is quite consumer-friendly. Gift cards and gift certificates sold by retailers never expire or carry expensive maintenance fees. (The law doesn't apply to VISA and Mastercard gift cards, however.) Should a store go bankrupt, however, gift cards can still become worthless. If a company files for bankruptcy, it’s up to the court to decide which financial obligations are honored. Gift card holders can file a claim, but they go to the back of the line behind other creditors. Even if a company in bankruptcy honors its gift cards voluntarily, there could be limitations on where and how the cards may be used. Tip: Use gift cards as quickly as possible and avoid buying cards from financially strapped retailers. 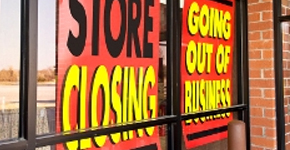 “All sales are final,” is the usual mantra at liquidation and going-out-of-business sales. While bargains can be found, unhappy consumers usually have little recourse. So carefully consider your purchase. Inspect the merchandise before you buy. If a business won’t let you open a box or plug in an item to ensure it actually works, consider walking away. Liquidation companies sometimes bring in merchandise that was never sold by the original retailer, so it’s also good to examine the overall quality of the merchandise. Ask about the refund policy. Often all sales will be final, or only exchanges will be allowed. Verify warranty coverage and service. Retailer warranties usually aren’t good if a company is out of business. If the item is backed up by a manufacturer’s warranty, you may have some protection. Read warranties to see if there are other places you can take the item for repair or service if needed. Use a credit card instead of cash or a check. If an item is defective or damaged, you may be able to request a chargeback from your card issuer. Shop around. Prices aren’t necessarily the lowest. If a retailer goes out of business, it probably won't be able to honor its own warranties and return policies. In that case, you likely will have to rely on a manufacturer's warranty to cover repairs or service. An extended service and repair contract backed by a third party is not ordinarily affected by the closing of a retail store. Tip: Verify warranty coverage and service. Retailer warranties usually aren’t good if a company is out of business. If the item is backed up by a manufacturer’s warranty, you may have some protection. Read warranties to see if there are other places you can take the item for repair or service if needed. Under Washington law (RCW 19.178), businesses must follow certain procedures when advertising and conducting going-out-of-business sales. These include recording a notice of the sale with the county auditor at least 14 days before sale begins. In addition, if the sale is part of a bankruptcy, receivership or other court-ordered action, a copy of the documents requesting court approval must be served on the attorney general at least seven days before the court may take action. Prior to the sale, the business either make an inventory list of all merchandise to be sold or compile all purchase orders issued in the 30 days before the notice was recorded. Any merchandise ordered during the 30 days prior to the notice must consist only of bona fide orders made in the usual course of business. No merchandise may be transferred from an affiliated business in contemplation of conducting the sale. Furthermore, no merchandise may be ordered, taken on consignment or transferred from an affiliated business after the notice has been recorded or during the sale. The sale can’t be advertised more than 14 days in advance. The sale can't last more than 60 days. Read the statute for further requirements.